Members of the We Design For… team were proud to have been part of BBM Sustainable Design‘s RIBA double award winning team. 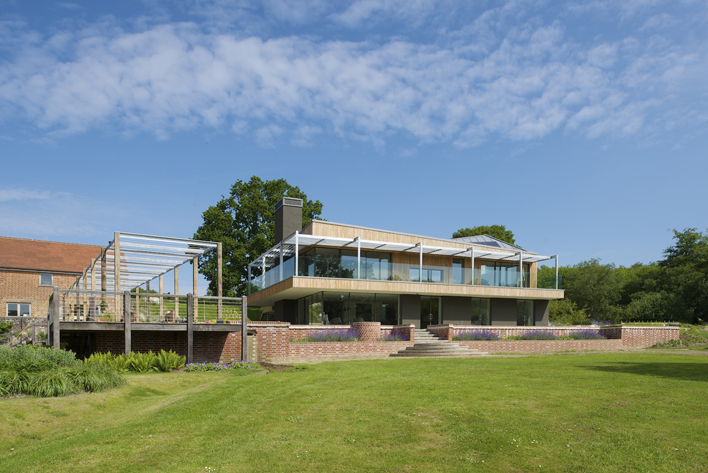 The project comprises the redevelopment of a derelict 1940s dairy into a new heated swimming pool, the retrofitting of a 19th century oast house and the development of a new country house set in 275 acres of Wealden countryside. 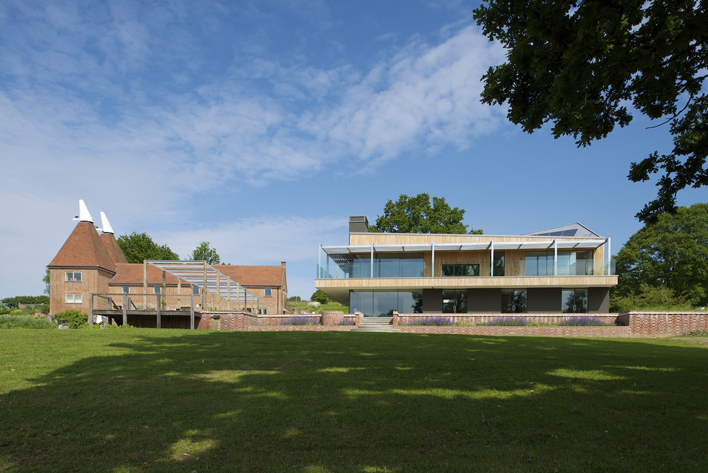 The new house was allowed to be more architecturally expressive, responding to the site, its topography, views, orientation and the forms of the adjacent Oast House. The roof is lifted up and twisted around to face due south, to benefit the solar panels. The roof also collects rainwater for re-use throughout the site. The estate’s 150 acres of woodland supplies biomass to heat this development which is designed as ‘Code for Sustainable Homes’ Level 5. A rammed earth wall greets you as to enter the house. Elsewhere lime plaster is applied direct to masonry walls and ceilings. The MEP design also includes an earth tube and heat rejection to the natural swimming pool. The Grade II listed Oast House had suffered from insensitive conversion in the 1970s. All the joinery has now been redone in oak, the wall re-pointed using traditional lime putty mortar and the roof replaced with clay peg tiles. All this was done while retrofitting the building to ensure its carbon footprint was reduced by 80%. BBM Sustainable Design’s passion for this site over seven years, married with their client’s vision, has produced a special collection of buildings and spaces. A self-sustainable masterplan by Studio Engleback for the 275-acre site has realised positive estate management and the four completed projects by BBM. The house itself clearly comes about through close dialogue between client and designer: it is an essay in brief-taking, in which the result has exceeded expectation. Freed from the constraints of working with existing buildings, the house has its own expression and is designed for quiet meditation as well as large family gatherings: in other words, home as family sanctuary. All in all, this project is testament to a long-term understanding between discerning client and committed architect. Of special note is the redevelopment of the dairy into the new pool house. 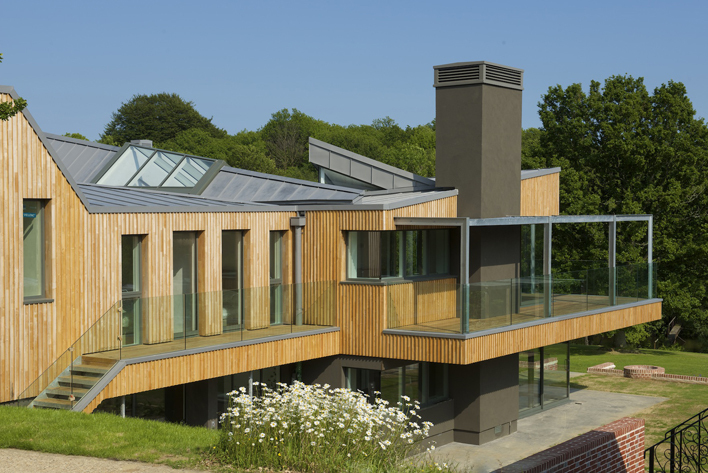 The restrained exterior gives no hint of the sophisticated spa facility inside, and the detailing of the now evenly-weathered chestnut cladding is a rare good example of the ubiquitous timber rainscreen.